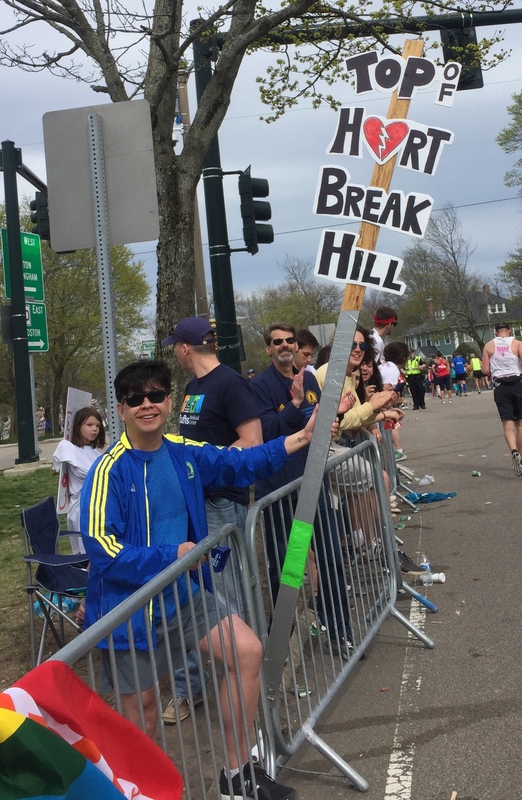 I have been struggling to write about my experience running the 2017 Boston Marathon. There are so many different emotions swirling around in my head that it has been difficult to distill it down into a post of under 1000 words. I could write a book about that race. 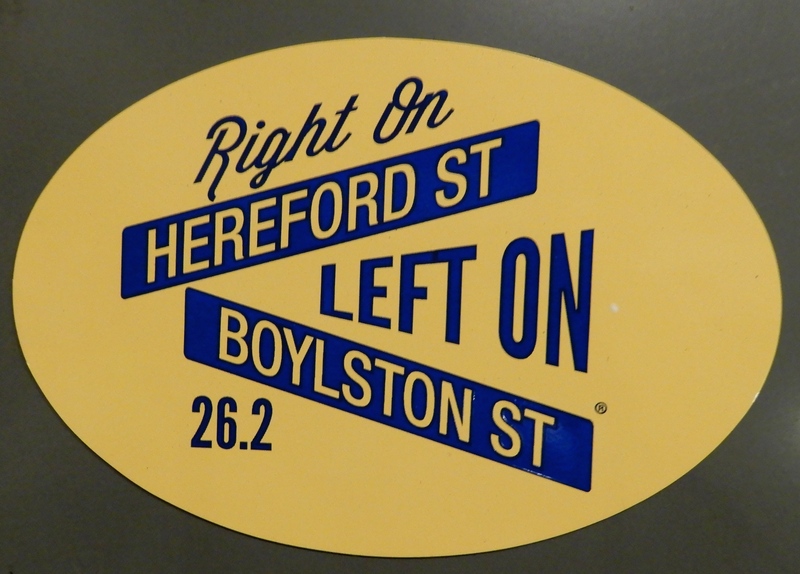 Today I realized the theme that most describes my Boston Marathon experience. It is a cliche but it fits: It took a village. It took a village to get me to the start line. In mid-February – 8 weeks before the race – I couldn’t run more than 6 miles before my ankle started to scream at me. I knew I needed to address the issue or I wasn’t going to be able to run the race. I went to a physical therapist, Jessica, and a rehabilitation fitness trainer, Carrie, who helped me work on ankle strength and flexibility. Carrie identified issues with my gait. She gave me a mantra to say as I ran, words that help my brain focus on proper form. I kept my running coach, Jenny, informed of my issues and she made adjustments based on feedback on my runs. Jennifer, my massage therapist, dedicated hours to ensuring the muscles in my ankle, foot, calf, and quads were loose. Through their collective efforts my 6-mile ankle was ready for 26.2 miles. Each of them was instrumental in getting me to the start line. 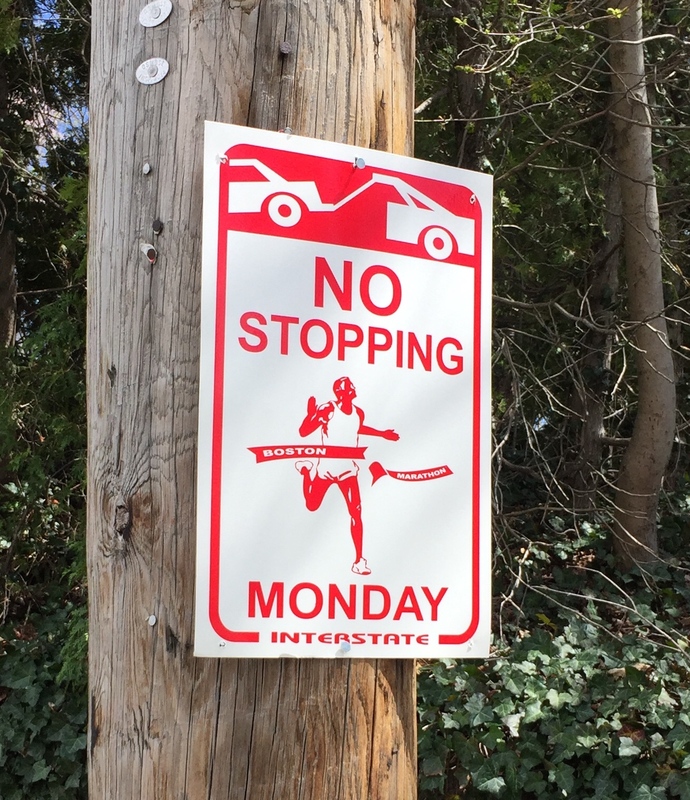 It took a village – a very large village – of race organizers, volunteers, police, and emergency responders to put on this race. The logistics for a race through 8 different cities and towns over a distance of 26.2 miles are more than you can imagine. They spend a year on organizing the event, coordinating resources and planning for every possible issue. I bet the race director was monitoring the weather forecasts all week like I was. Every time I looked it seemed the race day temperatures were predicted to be higher than the last forecast. On race day it was in the 70s – warm for any race and particularly warm for someone like me with Transverse Myelitis. Ever since my experience at the 2015 Rock ’n’ Roll Half in Savannah, Georgia, I am always concerned they will run out of water on the course. That would be disastrous. But the race organizers had that all covered and there was no shortage of hydration for the runners. Security was never a concern either. The course was lined with local, state, and military police, on foot and on bicycles. This was one of the best organized races I have ever had the privilege to run. The number of volunteers was incredible – 9,500 – that translates to one volunteer for every 3 runners. The only other race that I recall having as many volunteers was the 2015 Tokyo Marathon. 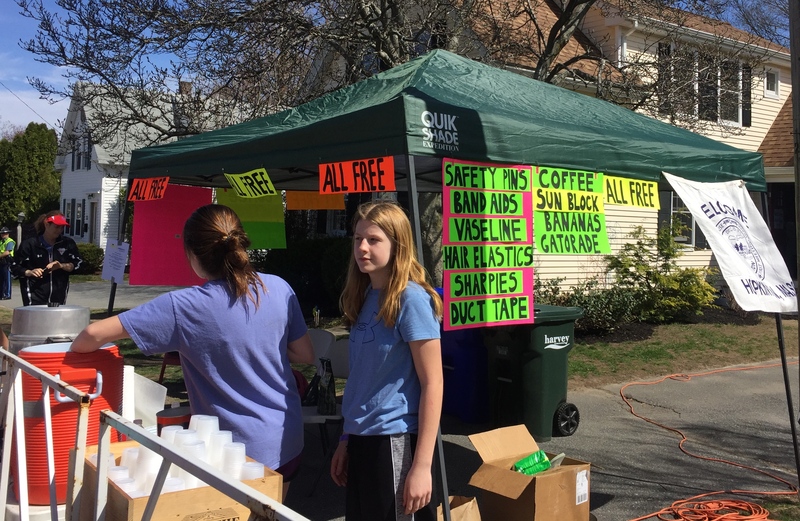 The volunteers stood for hours, on an unseasonably warm April day, handing out water, Gatorade, and Clif gels. And they were the friendliest bunch of people too. I felt an incredible sense of community as I ran. The people along the course came together to celebrate with the runners. This is their race, a source of pride for Bostonians. Many people who lived along the course handed out water, candy, oranges, and ice. Some even played music to entertain the runners as they passed by. The runners were welcomed. I have run for several charities before but none has touched me the way this one did. 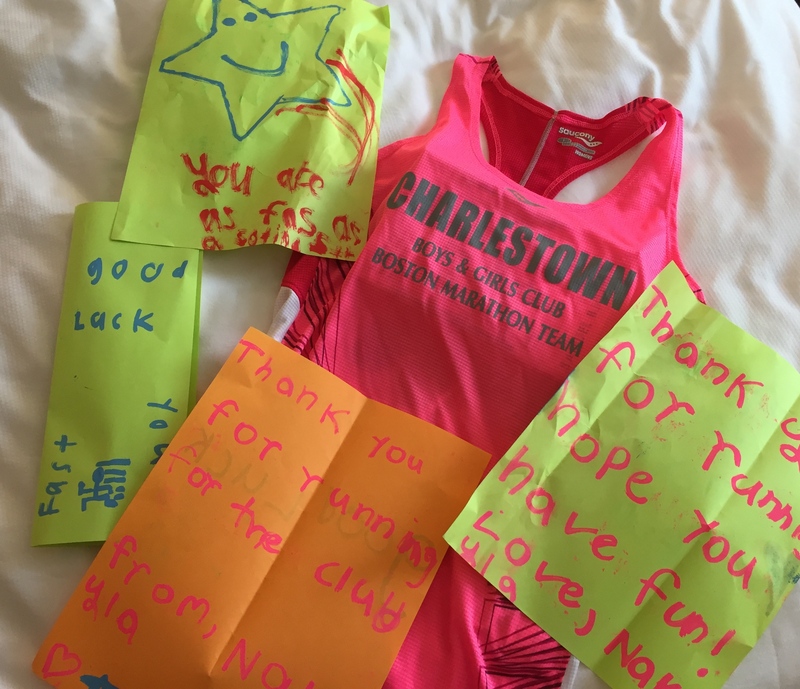 Enclosed with my team singlet were notes and drawings from the kids, thanking me for running for them as well as providing words of encouragement. In their minds I was doing something very challenging to help them. For one day I was their hero. What they didn’t know is that they were inspiration to me. When I had doubts on race day about finishing the marathon, I only needed to think about those notes to keep going. Yes, I would have liked to be a Boston Qualifier and entered the race without a fundraising obligation. But I never would have made a connection to a community of kids who need my help. They made my race about more than a medal. This race is a cherished memory for me because of them. 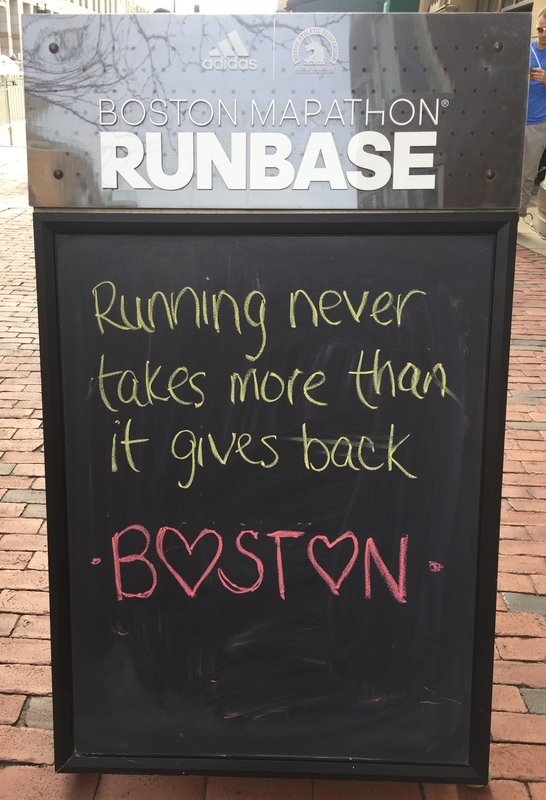 Over $36 million was raised for the various charities participating in the Boston Marathon charity program. The charity runners included many first time marathoners too. I encourage anyone who wants to run the Boston Marathon – both runners who qualify and those like myself who don’t – to participate on a charity team like the Charlestown Boys & Girls Club. Boston puts on a great race. Fundraising for their community is a terrific way to show appreciation for their hospitality. Because it really does take a village. Contact me if you would like to donate to the Charlestown Boys & Girls Club Boston Marathon team. The kids would appreciate anything you can do to help them.